Four months ago, I discovered a miracle. For those of you with long and thick eyelashes, you will never understand 😛 Folks like me with thin, short and sparse eyelashes (with single eyelids somemore) are weary of times when we see ourselves in photographs or reflections. I am the kind where no matter how much curling and mascara I use, I will never ever make my eyelash appear longer (Angel Eyes fibre mascara kit helped alot, but still nowhere near eyelash extensions. More of that in a later post). We had always looked so sleepy, as though we are a relative of Garfield’s. A visit to Angel Xing Beauty (located in City Plaza #02-36, which is at 810 Geylang Road, near Lion City Hotel. Nearest MRT is Paya Lebar MRT) solved this problem for me! Look at the difference! And, no more curling of lashes and wallops of mascara! Initially, my first pair (lasts from about 2-4 weeks) was thicker but I have switched to a more natural look. Each pair costs S$50 and basically it should last you one month. But for me, the lashes last me about three weeks. Based on my own experiences, the lashes would be the prettiest during the first week. After which, ‘they will ‘break’ (the lashes will not line the edge of your eyelids in a straight line) in about 2 areas along the lash line. The glue will also start to turn colour. By the third week, the glue should have changed from a clear appearance to a whitish colour because of constant contact with water (washing of face) and make-up (you need to use cotton buds to clean the area near your lash lines). By this time, you can probably see the glue obviously (some lashes may even come off because the glue is not sticky) but when viewed 30cm away, the glue is not obvious. 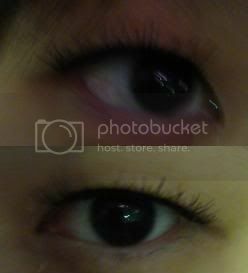 By this time, I would try to tug off the lashes by myself, but trust me, leave it to the ladies at Angel Xin. On a recent visit there, the lady boss (Xin Xin) showed me just how much damage I had done by tugging off the fake lashes. For those one or two stray lashes, it’s alright to try to tug them out, but try not to. Leave it to the experts. 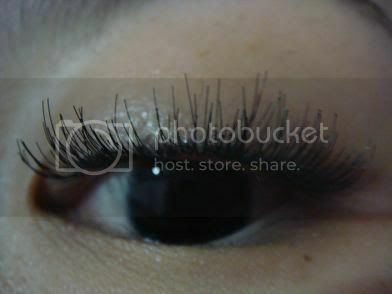 They use a dissolvent to dissolve the glue and remove the lashes painlessly. For more enquiries, you may wish to call Angel Xin at 6747 0205 or 9877 3886 and look for the lady boss Xin Xin. Or you can look for the girl who helped me with my extensions from the beginning till now (except the recent visit, where she was on morning shift), Min Min. I have already signed up for their package of 6 sessions for the price of 5, with a free touch-up (usual price: $10 onwards, depending on condition.) During all my visits there, there were always people doing their eyelashes and hair. I am so tempted to do the hair extensions. I got a quote from them that I would need to pay about S$150 for hair extensions. Anybody want to sponsor me? With Valentine’s Day only 10 days away, many guys will definitely run into cold sweat at the cold hard cash that we have to spend to please our other half. If you are the typical guy that feels that flowers on Valentine’s Day is a must-have for girls, look no further than Prince’s. Prince’s is my florist of choice and I find their prices to be reasonable and value for money. They are amongst the cheapest and yet well packaged selection that I have seen so far. Some online florists actually dare to charge an extra surcharge of around $60 for Valentine’s Day period delivery. Prince’s deliver free of charge for two time slots which is 9am – 5pm and 5pm – 11pm respectively. While the time range is really wide, as long as my girl get her flowers, I don’t care that much. If you want to have the flowers delivered at a specific time slot, be prepared to pay $20 or more. I came across FlowerPatch through a MSN personal message of my friend so I decided that it is about time to do another short review with Valentine’s Day approaching right after Chinese New Year. The first glance on the web page is the quality of the images used on the website. The closer shots are taken with some blur so it makes the flowers look not as attractive. For the bouquets of 1 or 6 stalks of roses, FlowerPatch did not showcase the photos of the full bouquets so it is harder to judge. The bouquets for 24 stalks of roses looks good but the price definitely turned me off. However, I guess that’s the price you have to pay to give flowers on Valentine’s Day. The lilies photos looks not bad but I think the packaging of the bouquets can be improved. There are no photos for their sunflowers so I can’t comment on that. Prices-wise, FlowerPatch is quite average for the bouquets they are offering. Personally, I will prefer Prince’s since my experience with them so far has been excellent. Behind Her Closet is a LiveJournal web shop that sells mainly accessories. It is run jointly by one of my friends in university but I will keep my neutral stand in my review on their collections. So far, I have noticed that their collections sell pretty fast and many items on their main page are tagged with a red ‘SOLD OUT’. However, BHC does offer remakes so it is no harm sending them an email to see if they can accommodate you. BHC has their own mailing list so it is helpful to subscribe and get updates sent to your email. I dropped by to check out their collections once in a while and I can’t help but notice that many of their products are of vintage theme. It is not to say that BHC is a vintage accessories shop but rather it’s their main focus. I do see some interesting accessories on their main page most of the time. I do like the style of some of their earrings but it is a pity that my girlfriend don’t fancy such earrings. So, don’t be afraid to check them out and purchase their collections. At the rate Behind Her Closet is growing, I am pretty sure that BHC will be quite as popular as Edynae. There are many methods of making payments online. One of the most common payment methods I find that many Singaporean shoppers seem to be bank transfer or mailing of cash. Personally, I am against the mailing of cash since there’s almost no security at all. One of the alternatives is online payment systems. Over my next few posts, I will be looking into various online payment services on the Internet. Although services like PayPal and Google Checkout are popular internationally, they are still not quite the preferred payment mode for Singapore online shoppers. Most of the common online payment systems use an email to identify the user. So, having an email address means you can create your own PayPal account. It is as simple as that. To explain how PayPal works to my folks, I usually refer PayPal as my online bank. I can link or de-link my debit or credit card to my PayPal account in order to make online payments. When I need the money, I will be able to withdraw my funds to my local bank account. As I am not based in the United States, it will normally take a few more working days for the transaction to be completed. I think that many non-users from my region are not familiar with this particular function of PayPal, though. While being user-friendly and widespread in its usage, PayPal is not without their disadvantages. My major complaint in over 3 years with PayPal has got to be their conversion rates when I make withdrawals to my local bank account. PayPal usually take a small portion as an administrative charge which is fair enough. People do need to make money for providing the service. However, what irritates me is that the exchange rate is ridiculous at times. The exchange rate given by PayPal is always way below the rates I get from XE.com. Doesn’t that imply that they are making money off me by giving me less favourable bank rates? It is an example of the Exchange Rate Effect that I covered a short while back. Overall, I still find PayPal to be a worthy service that served me well over the past few years in my online purchases. I have yet to try out Google Checkout though. I will come to that soon and get back to our readers with a review. I got a gut feeling that Google Checkout may give PayPal a run of its money being backed by the big G. What Checkout may be losing out now is its lack of widepsread usage.